St Bartholomew’s church is an imposing sight and it would take a performance and a half for this Goliath not to remain centre stage; however the Dulwich Players’ "Murder in The Cathedral" was the perfect David. I don’t want to conjure up a fight as this venue – the production worked in perfect harmony. Gill Daly’s ingenuity was a real triumph in setting T.S. Eliot’s powerful play here. St Bartholomew’s gave a backdrop that would rival La Scala, providing an inspiring atmosphere. You can’t buy atmosphere and this production had buckets of it, held within the columns and vaults of this beautiful church. Paul Sykes’s performance as Thomas Becket had me transported back to The Oratory in Birmingham where I spent many an impressive sermon. Eliot’s play is multi-thematic not only in the story of Christianity reiterated within the subtext of the play, but also in the mirroring of the temptations of Christ. Power clearly dominates the piece; however what also creeps in are notions of ascension and the vulnerability of men, particularly King Henry II. I enjoyed the ascension of Beckett through the piece, his development within himself and his faith. Eliot’s play and Paul’s performance brought out Becket’s ascension to his detrimental death. 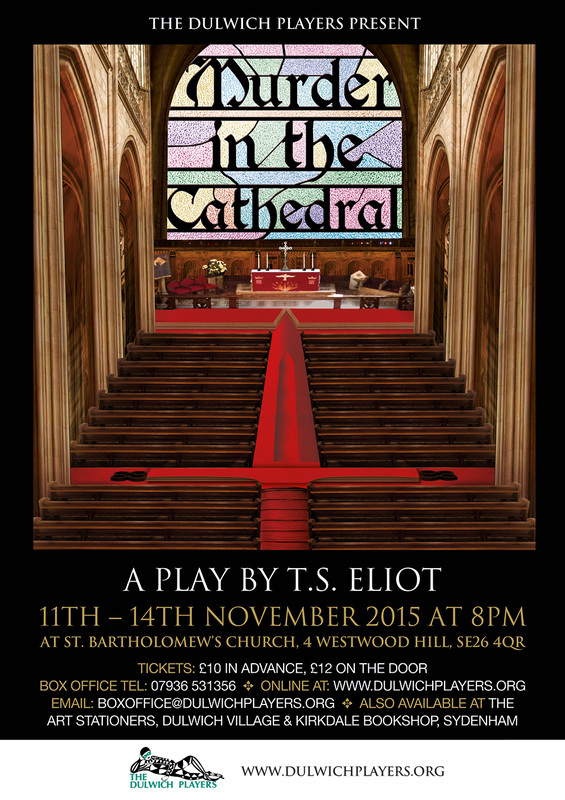 Throughout the play there was a lovely use of the pulpit by Becket and other characters. I’m not a religious person and I could have been distanced from this piece but I felt engaged by it. Oh, that brings me on to the mention within the piece of Christmas day. It gave me quite a start. I thought “come on it’s only November!". 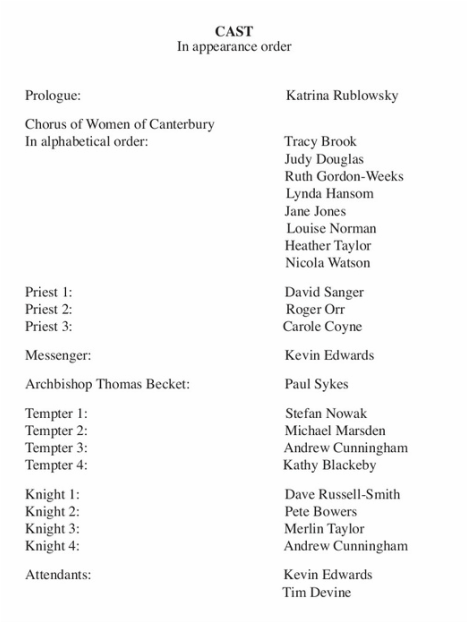 Everyone gave a marvellous performance from the women of Canterbury to the steadfast and strident knights; however Paul Sykes and Kathy Blackeby stood out for me. Kathy gave a captivating performance which I thoroughly enjoyed, such lovely intensity. This was a thoroughly well thought out performance on many levels. 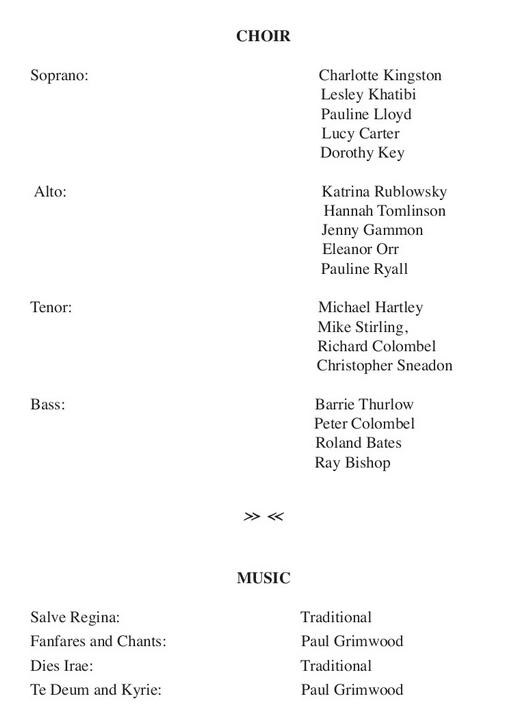 The subtle and often invisible choir enveloped the performance like luxury gift wrap, and all from the shadows. The second half of the production burst with very well-conceived, imaginative and captivating shaping. Suddenly the imposing church felt a subtle backdrop to a captivating piece of theatre, each scene moving and sharing the space. "Murder in the Cathedral" broke the fourth wall, with cleverly considered entrances placing the audience in the action. The action was far in the distance, beside you and above you simultaneously. This was the best symbiosis between play and venue I’ve witnessed in some time. I’m not sure how it will feel watching a play on a stage with a proscenium arch again. 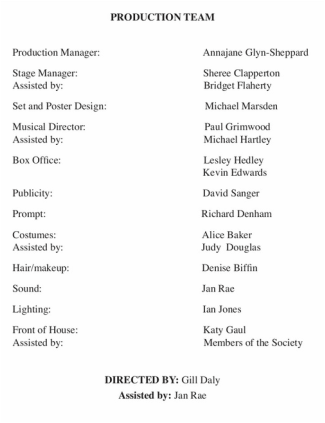 Congratulations to the director, Gill Daly, as this was certainly a piece with theatrical credibility and to all the performers and technical staff, who made this a very enjoyable piece (considering the subject matter).